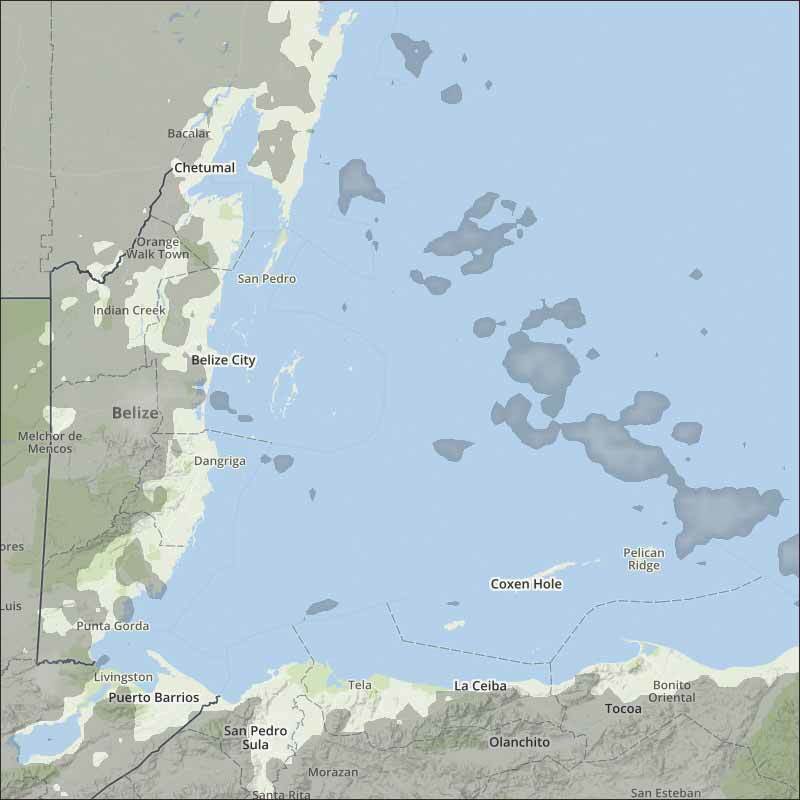 Belize NMS: Mainly fair and relatively dry conditions will continue over most of the area. 24-hour forecast: Sunny with a few cloudy spells today and partly cloudy tonight. Showers will be generally isolated with a few more over the south. General Outlook: Thursday and Thursday night is for mainly fair and mostly dry weather to prevail. Today E-SE 10-20 kts Choppy-Moderate 3-5 ft ISOLATED SHOWERS. Tonight E 5-15 kts Choppy 3-4 ft ISOLATED SHOWERS. Tomorrow E 10-20 kts Choppy 3-4 ft CHANCE OF ISOLATED SHOWERS SOUTH. Outlook E-SE 10-20 kts Choppy-Moderate 3-5 ft LITTLE OR NO RAIN. On Ambergris Caye this morning we have a wind from the E-SE at 9 mph. The sea around our islands barrier reef is moderate. Today's expected high is 84. Despite some significant patches and streams of Caribbean cloud coming in from the east, there is very little rain with it, just a few small patches in the Stann Creek areas. Looks like today will be mainly sunny, with white clouds building, small chance of a few small rain showers. FEBRUARY 2018 WAS WETTER THAN NORMAL ACROSS THE COUNTRY WITH MOST STATIONS RECEIVING MORE THAN DOUBLE THEIR AVERAGE RAINFALL. THE INCREASED RAINFALL AMOUNTS CAN BE ATTRIBUTED TO MOISTURE SURGES PRODUCED BY THE TRADEWINDS. MOST OF THE MONTH WAS WINDY INCLUDING THE THIRTEENTH WITH GUSTS BETWEEN 25-35KTS AND UP TO 45KTS AT THE PORT OF BELIZE IN BELIZE CITY. NO FRONTAL SYSTEMS TRAVERSED THE COUNTRY. THE MONTH STARTED WITH A SURFACE TROUGH NORTHEAST OF THE COUNTRY WHICH PRODUCED CLOUDY SKIES ALONG WITH A FEW LIGHT SHOWERS OVER CENTRAL AND OFFSHORE AREAS IN THE MORNING. SKIES REMAINED CLOUDY ON THE SECOND WITH PERIODS OF RAIN OVER CENTRAL AREAS AND THE NORTHERN SLOPES OF THE MAYA MOUNTAINS WHILE ON THE THIRD RAIN OCCURRED MOSTLY OVER CENTRAL AND SOUTHERN COASTAL AREAS THEN BECAME ISOLATED BY MID-MORNING. A LIGHT EASTERLY AIRFLOW PREVAILED FROM THE FOURTH TO THE SIXTH WHICH SUPPORTED MAINLY FAIR WEATHER WITH ISOLATED SHOWERS OVER NORTHERN AND CENTRAL AREAS ON THE FIFTH AND OVER THE SOUTH ON THE SIXTH. THE SEVENTH SAW PARTLY CLOUDY TO CLOUDY CONDITIONS AS A FEW SHOWERS AFFECTED CENTRAL AND SOUTHERN COASTAL AREAS. ON THE EIGHTH THE SHOWER ACTIVITY CONTINUED OVER SOUTHERN AND CENTRAL AREAS BECOMING CONFINED TO THE MAYA MOUNTAINS IN THE AFTERNOON THEN TO CENTRAL AND COASTAL AREAS DURING THE NIGHT. A SIMILAR PATTERN WAS OBSERVED ON THE NINTH. ON THE TENTH A MODERATE TO GUSTY EAST TO SOUTHEAST AIRFLOW PREVAILED AND A FEW SHOWERS OCCURRED OVER THE ORANGE WALK AND COROZAL DISTRICTS BUT BY NIGHTTIME CONDITIONS WERE MAINLY FAIR AND DRY. ON THE ELEVENTH SKIES WERE PARTLY CLOUDY ACROSS THE COUNTRY AS WEATHER CONDITIONS WERE GENERALLY FAIR WITH NO RAINFALL AND A GUSTY EAST TO SOUTHEAST SURFACE FLOW PREVAILED OVER THE AREA. BY THE TWELFTH A FEW SHOWERS DEVELOPED OVER THE SEA AND MAYA MOUNTAINS IN THE MORNING AND CONTINUED OVER THE MAINLAND IN THE AFTERNOON SPREADING TO THE COAST AND OVER THE STANN CREEK DISTRICT DURING THE NIGHT. ON THE THIRTEENTH A MOIST AND GUSTY EAST TO NORTHEAST AIRFLOW PREVAILED WHICH SUPPORTED SHOWERS OVER COASTAL AND INLAND AREAS MOST OF THE MORNING AND EARLY AFTERNOON THEN OVER THE SEA AND NORTHERN AREAS OVERNIGHT. ON THE FOURTEENTH A FEW EARLY MORNING SHOWERS CONTINUED TO AFFECT THE NORTH THEN A FEW SHOWERS DEVELOPED AROUND THE COUNTRY DURING THE AFTERNOON AND AFFECTED ONLY THE SOUTHERN HALF OF THE COUNTRY DURING THE NIGHT. 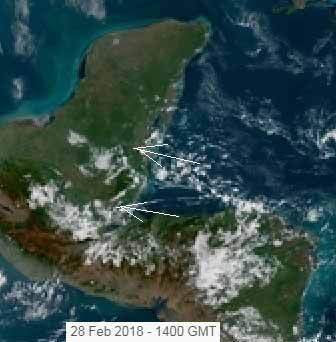 THIS ACTIVITY CONTINUED ON THE FIFTEENTH AS SHOWERS DEVELOPED AROUND THE COUNTRY BUT ESPECIALLY OVER THE BELIZE AND STANN CREEEK DISTRICTS AS A GUSTY EASTERLY AIRFLOW PREVAILED. BY THE SIXTEENTH CONDITIONS WERE GENERALLY FAIR WITH SHOWERS DEVELOPING ONLY ALONG THE STANN CREEK COAST AND OVER THE MAYA MOUNTAINS. THE SEVENTEENTH STARTED OUT MAINLY FAIR WITH ISOLATED SHOWERS BUT DURING THE NIGHT A LINE OF SHOWERS PASSED OVER THE COUNTRY AND AFFECTED MOSTLY NORTHERN AND CENTRAL AREAS. ON THE EIGHTEENTH A GUSTY EASTERLY AIRFLOW PREVAILED AND SKIES WERE MOSTLY CLOUDY WITH A FEW SHOWERS OVER NORTHERN AND CENTRAL AREAS WHICH SPREAD TO MOST DISTRICTS AFTER MIDNIGHT BUT BECAME ISOLATED BY SUNRISE. WEATHER CONDITIONS WERE SIMILAR ON THE NINETEENTH WITH A FEW SHOWERS OVER THE CENTRAL AND NORTHERN AREAS IN THE MORNING AND ISOLATED SHOWERS DURING THE NIGHT. ON THE TWENTIETH MAINLY FAIR AND WINDY WEATHER PREVAILED WITH ONLY SHALLOW CUMULUS CLOUDS AND ISOLATED SHOWERS OVER THE EXTREME NORTH IN THE AFTERNOON . THE GUSTY EAST TO SOUTHEAST AIRFLOW CONTINUED ON THE TWENTY-FIRST ALONG WITH A FEW SHOWERS OVER NORTHERN AND CENTRAL PORTIONS OF THE COUNTRY IN THE MORNING THEN MOSTLY OVER THE MAYA MOUNTAINS IN THE AFTERNOON AND OVERNIGHT. 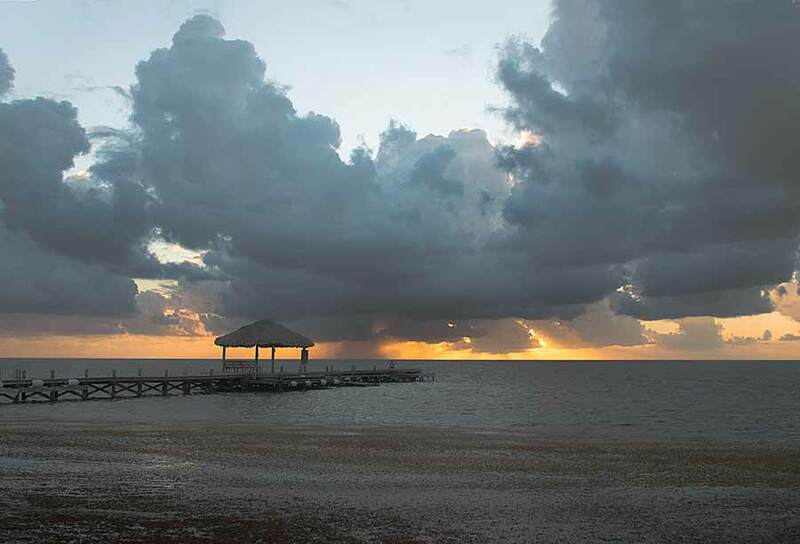 ON THE TWENTY-SECOND SHOWERS DEVELOPED OVER NORTHERN AMBERGRIS CAYE DURING THE MORNING THEN A FEW SHOWERS MOVED ACROSS CENTRAL AREAS AROUND MIDDAY AND OVER SOUTHERN AND COASTAL WATERS AT NIGHTTIME. SHOWER ACTIVITY PERSISTED AROUND THE COUNTRY MOST OF THE TWENTY-THIRD THEN THE ACTIVITY BECAME ISOLATED OVERNIGHT. MAINLY FAIR AND DRY WEATHER PREVAILED FROM THE TWENTY-FOURTH TO THE TWENTY-FIFTH AS THE AIRFLOW REMAINED GUSTY AND FROM THE EAST-SOUTHEAST. THE TWENTY-SIXTH STARTED WARM AND DRY WITH NO RAINFALL THEN A FEW SHOWERS AFFECTED THE BELIZE, STANN CREEK AND TOLEDO DISTRICTS DURING THE NIGHT. BY THE TWENTY-SEVENTH MAINLY FAIR CONDITIONS RETURNED DURING THE DAY WITH LIGHT EASTERLY WINDS AND ONLY ISOLATED SHOWERS BUT OVERNIGHT A FEW SHOWERS DEVELOPED OVER CENTRAL AREAS INCLUDING THE AIRPORT. THE LAST DAY OF THE MONTH A MODERATE EAST TO SOUTHEAST AIRFLOW PREVAILED AND PRODUCED FAIR, WARM AND MOSTLY DRY WEATHER CONDITIONS.